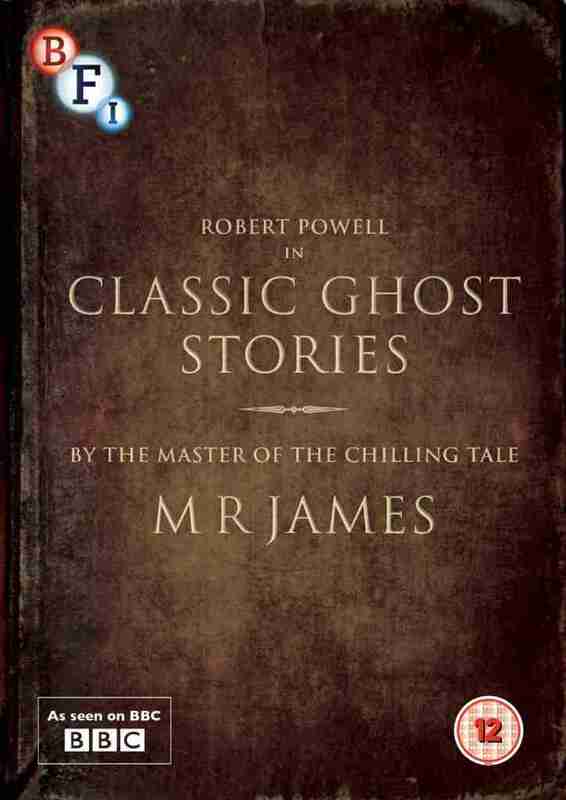 Classic Ghost Stories by M.R James with Robert Powell (BFI). M.R James’ ghost stories seem almost tailor-made for television and radio. They’ve taken on so many forms and guises over the years that, like their original forms read by the fireside at Christmas in Cambridge University, they have become a regular, traditional event. Though their presence has been somewhat thin on the ground of late (though soon to change with the fourth modern adaptation coming to screens later this year in the form of Mark Gatiss’ adaptation of The Tractate Middoth) the recent haul of DVD releases from the BFI shows that this was far from the case in Television’s golden age. This release brings together two different shows using one particular aspect of James’ storytelling style; the late night fireside ghost story. The chills are comfortable but lingering, designed to evoke cravings for the warmth of the fireside and fear of the cold, blustering night outside. These programs (along with the modern Christopher Lee readings available on previous BFI Ghost Story releases) are as close as possible a viewer can get to experiencing James’ work as they were originally intended. In spite of the creative success of Lawrence Gordon Clark and Jonathan Miller’s adaptations, they can’t help but feel distanced from the original format: in other words, they had no choice but to adapt and innovate to the new form of third person drama. Classic Ghost Stories has the massive benefit of Robert Powell as its chief story-teller. He is perhaps the best actor to perform the material (even better than Lee in spite of his genuine connections to James himself) already with the confidence of Mahler (1974) and Jesus of Nazareth (1977) under his belt. They raise James’ already startling stories to new heights of eeriness, capturing that sense of slow realisation that comes with best of the author’s work. This series has five episodes, all directed by David Bell. With the obligatory Oh Whistle, and I’ll Come to You, My Lad and The Ash Tree as well as The Mezzotint, The Rose Garden and Wailing Well, the mini-series sets up the best of Jamesian tropes and uses them and their language to startling effects. The clash often found in James’ work between the Victorian values and the increasingly modern Edwardian values of times the stories were written in is somewhat removed from the series by the setting of Powell’s study in an overtly Dickensian realm. This perhaps may explain why the stories feel far more relaxed and welcoming; a ruse of course as anything welcoming in the Jamesian world will always show its true, deathly colours in time. The other Jamsian trait that the series takes full advantage of is the ever-present “Inorganic Demon”; objects that harbour or allow spectres and creatures to appear and travel. The Mezzotint in particular is wonderfully effective with its story of a possessed picture being realised by excellent artwork engravings by Barry Wilkinson. Wailing Well is equally as filled with objects, managing to make period pictures of scouts seem entirely spooky and believably part of James’ world. Also on the release are three episodes of Spine Chillers with Michael Bryant in the role of James the storyteller. Unlike the video transfers for Classic Ghost Stories with Robert Powell, Spine Chillers seem like an entirely different creation, sourced from the original 16mm prints giving them an instantly different aesthetic. They lack the gusto of Powell’s readings with Bryant seemingly in the need to rush out to dinner, quickly telling the stories before an evening out. His apparel of smart dinner-wear also adds to this strange situation. Though the series manages James’ stories well, adapting the particular difficult (in terms of storytelling) A School Story and The Diary of My Poynter, it pales in comparisons to its series peers. This is never more so than in the only shared story on the disc, The Mezzotint; which seems straight and coldly read compared to Powell’s nuanced and vivacious reading. The essay booklet talks of other episodes of the series with the likes of Jonathan Price playing H.G Wells sounding like a real treat. Perhaps it is the context that weakens this series’ inclusion which would otherwise seem strong in on its own terms. Aside from this, James is never better served as story-teller than in this format. There’s something almost child-like about the situation, recalling when stories were read at night to the younger. This sense of wonder, fear and perhaps even nostalgia is captured perfectly in the series and makes it an essential release for fans of the gothic and the haunted as well as ardent readers of James himself who will be hard pushed to find a truer form for his stories. Classic Ghost Stories is released by the BFI on the 28th of October. 3AM: Wonder, Paranoia and the Restless Night – The Bluecoat (Liverpool). The Lady Vanishes (Alfred Hitchcock, 1938) – Early Uses of Musical, Narrative Tools.